I’m thrilled to share this guide with you. I don’t claim to have the “cure” for autoimmunity – nor do I “treat” any of my clients. But many have seen their autoimmune antibodies plummet – and with that, a reduction in the symptoms that were keeping them from living a fulfilled and prosperous life. I believe that the stark rising in autoimmune conditions is a direct byproduct of the modern world we live in. But that doesn’t mean you’re powerless against it – even the most serious and life-altering cases of autoimmunity can be managed. I’m here to give you hope. You can outsmart autoimmunity. 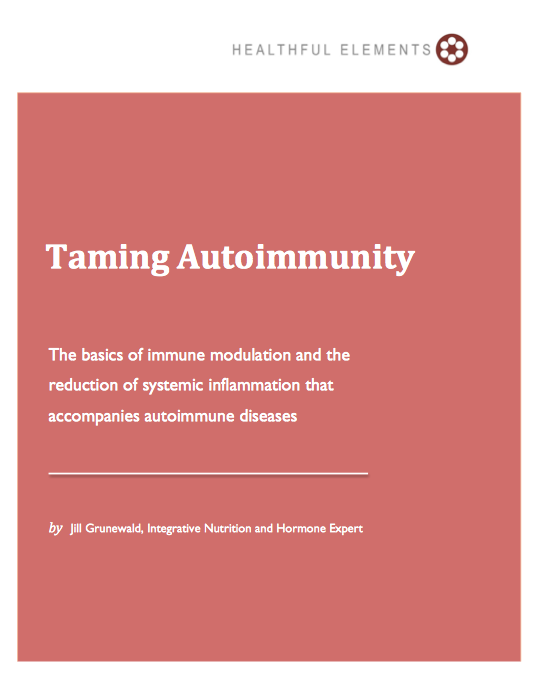 << Enter your name and email on the left to receive my eGuide, Taming Autoimmunity. Enter your name and email to receive my Taming Autoimmunity eGuide. You'll also receive regular, helpful insights from us on hormone and immune health. We hate spam too. We'll never sell or rent your email address, ever. If you have alopecia, I simply can’t recommend Jill highly enough. My work with her has been life changing.